I love my Pouchee. I love, love, love it! And, when I was thinking about what I wanted to give away to you all during this most festive month, it was the first thing I thought of. I have had mine for over a year now, and I still use it everyday, I still love it, and I still tell people about it ALL THE TIME! 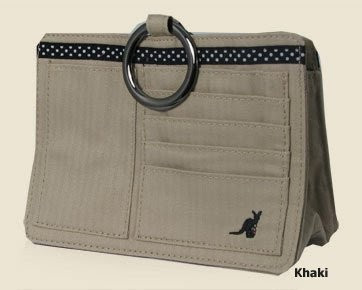 The Pouchee is a small (7.5" x 5") purse organizer/wallet/cell phone holder thingy that holds all of the "important" stuff in your purse. There are pockets for credit cards, a cell phone (even a pocket big enough for a Blackberry - for my fellow Crackberry friends), sunglasses, keys, lipstick, etc. Inside are dividers that you can use to separate coupons, a checkbook, change purse, old receipts - anything you want to keep easily accessible. 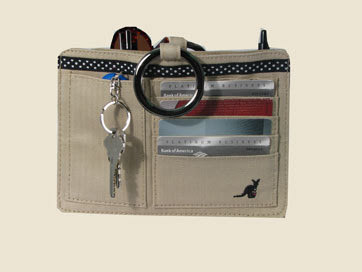 If you decide to change purses periodically, grab your Pouchee and move it on over. Done. One of the things I LOVE most about it is that I can leave my purse - which often doubles as a diaper bag - in the nursery at church or with a friend or babysitter and pull out my Pouchee to take with me. All of my important items are with me, and all of the baby stuff is with them. With the cute little rings at the top, it looks like a small purse. So, today - you can win a brand, spankin' new Pouchee! A khaki one - goes with everything, neutral, perfect! Ooooh, I love it. So will you - and if you already have one, it would make a GREAT Christmas gift! 1. Think of your favorite childhood Christmas memory. 2. Share it in the comments. 1. Post a link to this giveaway on your Facebook page. 2. Post a link to this giveaway on Twitter. *Leave an additional comment for each one of the things you do so that your extra entries are counted when I do the "drawing". That's FOUR chances to win! I'll leave this giveaway open until this Friday, December 4th at 9pm EST. And, I'll let the good ol' random thingy choose a winner that night. I'll announce the winner then. I'm looking forward to reading your Christmas memories! *Disclosure: This Pouchee was provided to me by Pouchee.com as a give away for you. I did not receive a Pouchee to review or keep for myself, nor did I receive any financial compensation for telling y'all how much I love it! Favorite Christmas memory has to be my parents making Santa so "real" to us. My Dad put baby powder on his boots and walked around the Christmas tree to leave Santa's magic snow footprints. Also shook bells outside our windows. Also laying on the floor in my doorway, whispering to my little brother about what we were going to find the next morning. I don't know why but it always makes me smile that EVERY YEAR there would be an orange at the bottom of my stocking. I don't like oranges, we never ate the orange but it was always there. I do it for my kids now and they always ask, Why is their an orange in here??? This is hard because Christmas is so dear to my heart- I love everything about it! One of my favorites was when Arianna was little. We told her we were sprinkling oatmeal on the deck to feed the reindeer. Then later on we put boot prints out on the snow covered deck and sprinkled mini choc. chips to look like reindeer poo. She was so excited in the morning to see where Santa landed with the reindeer! The year I have my most vivid memory is when I peeked! It was the year of "The Cabbage Patch Doll" and I wanted one soooo badly. I was old enough to know that my mom set up all the gifts and usually our "big" gift was unwrapped in front of the tree. We had a house with a cathedral ceiling over the living room with a loft above it. It was a huge "no,no" to go into the loft on Christmas morning since we could see our presents below, but the anticipation overtook me and I just HAD to see if I was getting the coveted doll! I remember crawling on me knees and hiding in the corner so no one would see me in the loft room- feeling super guilty because I wasn't ever a naughty kind of girl and this was completely out of character for me. When I saw the doll sitting in a cabbage patch high chair with a food play set and all the trimmings around her, it was such a feeling of elation. I was so excited! But the feeling soon turned to misery as I realize I would have to LIE to my mom and recreate my once-in-a-lifetime excitement all over. I did fake my way through the gift opening, and to this day I don't know if my mom knows about my deceit. (She will now since she reads the blog! LOL!) But, I was forever changed and never had the desire to Peek and then subsequently LIE again! I love Christmas. There are many memories that stick out but I do remember the year I received a new homemade robe and Bible. I can picture myself sitting in our big chair with my robe(handmade by Mom) on and reading my new Bible. What a wonderful memory! I love seeing my children now as they enjoy Christmas. Each year as they get older our prayer is thay they fully grasp the true meaning of Christmas and what God has done for them. Posted this to FB! HUGS Sarah! One of my favorite Christmas memories, was when I was 10. There were lots of presents under the tree, but when we passed them out, I didn't have as many (you know the comparison game). I tried to act content with what I had, but deep inside I was disappointed. Then my dad asked me to go get some snacks from the kitchen. When I dragged my feet into the other room, to my great surprise was a beautiful 10 speed blue bike! It was a great surprise. My favorite memory involves my kids. When Jenna was three years old I bought new "days of the week" undies for her and undies and socks for all the girls. They were wrapped and under the tree. About a week before Christmas we went out to dinner with my parents. While driving in our van I noticed she had NEW SOCKS on. I asked her where she got them from. (I knew they were the ones from under the tree.) She smiles the biggest smile and said, "Oh, they are new! Do you want to see my undies, too?" My older girls giggled their heads off. When we later got home I found wrapping paper shoved behind the couch and miraculously Lindsey and Alicia had new undies and socks stuffed in their dresser drawers as well. Leave it to Jenna! I can still see her sweet little face looking all proud of her new goods. Oh my! That does sound and look like a cool little pouchee! Please put my name in the drawing. I tried to add your cookie link but wordpress isn't cooperating. Or I'm just not that saavy. my favorite memories as a kid were always going to christmas eve church with my grandparents and then coming home and staying up all.night.long with my dad to watch the marathon of "A Christmas Story" on tbs... i still watch that movie every year no matter where I am on Eve. My favorite childhood memory of Christmas is the last one we had of our entire family together, there was laughter, food, and my Grammy. While they say each year gets better, it's just never the same... I miss her laugh, her love, and her silly little gifts she used to hunt down for each of us. My do I miss her. i have been wanting one of these since last year. it is on my christmas list again. if i don't get it i will definitely be using my "blow money" to buy it. favorite memory: every year my parents hired a santa claus to come to our house on christmas eve before we had dinner. he would come in with his bag and we would each receive a gift BUT the best thing about santa is that he sat next to our nativity, read the christmas story out of the book of luke, sang christmas carols (both religious and secular), and made sure are eyes were on the true meaning of christmas. i love how my parents gave us the experience of santa but still kept the focus on jesus' birth. i posted the cookie exchange on my side bar.... can not wait!!! Of course many of our favorite memories are the same...I have a zillion and it's hard to choose just one. I think we LIVED for Christmas as kids. I do remember one year (I think I was in third grade) that I wanted a Strawberry Shortcake sleeping bag. Well, we went to the mall on Christmas Eve to see Santa, and I told him that's what I wanted. Bless his heart, he said, "Well, I don't know about a Strawberry Shortcake sleeping bag, but I know there will be something else you love under the tree tomorrow morning." I'm sure that's all he could say, but I was smart enough even at that age to know I probably wasn't getting one. Sure enough, though, it was there, in all its aqua blue glory. Oh the joy! I remember vividly the year that Midnight ate my stocking - the WHOLE THING. Every year after that I had a fuzzy stocking that didn't match the others. LOL! P.S. I know this doesn't count as a childhood memory, but I fell in love with Brett at Christmas - our first date was December 23 (we went rollerblading at the beach) and the next night after Christmas Eve service he brought a Christmas tree to my new condo I had just moved into and helped me decorate it (apparently he wasn't putting the lights on fast enough and I took them away from him and did it myself - I will NEVER live that down!). Later when we were talking he held my hand for the first time, and I just *knew* that it was the beginning of the rest of my life with him. That was better than all my childhood Christmases put together! When I was 10, my sisters and little brother came downstairs on Christmas morning only to find my grandma in our kitchen. Mom and Dad weren't there. Apparently, my youngest brother decided to be born that morning. 10 lb, 11 oz. and the nurses crammed him into a Christmas stocking for pics. I don't remember anything I got that year. He sure was cute! I left a link on my FB! Yay! Favorite Christmas memory is watching the Sesame Street Christmas special. Santa used to ALWAYS come to the door to see us while it was on. I keep forgetting to ask my parents who Santa was. It was always so exciting! Favorite memory is hanging up our stockings on Thanksgiving day when we see Santa on the parade! Still carry this tradition on with my family! My favorite Christmas memory was the year my family started doing our "spendless" Christmas. We each drew names for each other, and then had to make a gift for each other. When we exchanged the gifts on Christmas morning the person giving the gift had to say something they loved about the person they were giving it to, and then everyone went around and said something that they loved about the person. I left that Christmas exchange feeling so warmed with my families love, and the love I had for each of them. It was wonderful. Another entry for adding the Christmas Cookie exchange on my sidebar! My favorite memory has to be Christmas breakfast! No one makes better pancakes than my dad with his good ole fanny farmer recipe! We'd have pancakes, eggs, sausage, and hot chocolate! Then we'd sit by the fire and read the Christmas story from Luke 2. Then the gift-giving would begin! I always remember our Christmas Eve traditions. My dad was the minister (and still is), and our family took care of most of the Candlelight Christmas Eve service at church. We'd go over in the afternoon and find odd tables and white sheets and drape the sanctuary to make a serene environment. We'd prep the candles and get everything ready before heading home for a nice steak, candlelit dinner. During the service, we'd offer special music and others were involved too. We'd moved several times, but most of the traditions remained. Favorite Christmas memory...my dad's hiney sticking out from under the tree while he was watering it. Everyday. Hiney. We laughed and laughed. Everyday. I loved dozing on the couch Christmas Eve while my mom puttered around the tree, prepared her famous coffeecake (which went into the oven first thing Christmas morning), and listened to Christmas music. I always hoped to catch a glimpse of Santa, but instead my mom would just carry me up to bed when it got too late. Linked on fb! Thanks, Sarah! favorite christmas memory...a little santa lipgloss i got from two friends the same year. i loved that thing. and those people! a memory that comes instantly is when my dad was away serving in vietnam. my mom, trying to keep the idea that santa was real to my little brother, took one of my dad's military boots, stuck it in the fireplace ashes and made foot prints on the hearth. my brother was thrilled see the proof of santa's visit. but then, on one of the toys santa left, there was a price tag. my brother questioned it. his conclusion; santa didn't make his own toys. he bought them at the store. it was the next year that my mom told him the truth. i still smile at this story. i can still see my brother's perplexed face as he tried to figure out why there was a price tag on his toy. thanks for having such a nice give-away. We always had our Christmas on Christmas Eve and before we opened presents. My Dad would light a candle and read the Christmas story. After that everyone would choose a carol to sing and we would all sing together. I do the same thing now with my family. I love it! My favorite memory of Christmas are the Christmas eve services we have done as a family. With my dad as a pastor, he tried to get creative each year. Often, we would put on a play as a family. One year my dad wrote a little play about a king and queen (played by my parents), I was their party planner helping them prepare for a royal birth and my sisters were 'wise girls'. It was great bonding time and always put the focus back on Christ. My favorite memory is CHristmas Eve night, going to church and then heading home to open gifts! So I always associated opening gifts with it dark outside and the lights twinkling on the Christmas tree. my favorite christmas memories have to be when my kids stood in awe looking at the christmas tree with the lights on. The older ones all did it and this year my youngest did it! I would have to say best memory is well not happy about it but my parents divorced when I was 4, so as a child that meant more Christmas's. We have one with mom, then go to dad's, then go to grandmas. So as a child 3 Christmas's was awesome. I used to love going around the neighborhood looking at all the xmas lights...Still do! My favorite Christmas memory is (homemade) matching pajamas for my brother and I .... fast forward about 30 years and I have great memories of my own brood in their matching (homemade) pajamas. Favorite Christmas memory... might just be the twelve day of Christmas ornament my Grandpa bought me at Bob Evans... spontaneous little gift purchased as we checked out after lunch. But he died before the next Christmas. I hang it on my tree every year and think of him. I have found since my Mom died that my childhood Christmas memories are even more vivid and even more special and heartwarming. Probably my favorite Christmas memory---oooohhh soo very hard to choose is one year I had a birthday party to go to the night our family was decorating the tree for Christmas. I remember helping our family pick out the tree and start the decoration process---complete with Nat King Cole in the background softly, but then I left for the bday party. I'll never forget the feeling when I returned later that evening to see the house transformed (because truly my mom had a gift when it came to decorating a house)---the tree was complete, the house was "Christmasified"---I remember pulling up outside the house and thinking how beautiful everything looked from the outside---and then how wonderfully warm and fulfilling it felt to run inside to my wonderful family. I still love coming home late at night during Christmas season to see the house decorated and lit both inside and out. The very best was when we couldn't afford the Pink Panther bicycle I wanted, but my dad bought a used one and spent hours fixing it and painting it the exact same shade. It was quite the Christmas morning extravangza! i got a doll one year that looked JUST like a real baby. my grandma had bought a bunch of real baby clothes and diapers to put in her basket. it was sweet - especially when you're 4.
i also remember waking up super early with my brother and waiting WAITING WAITING for my dad, who was a snow plower, to come home. we'd sit on the kitchen table and watch the snowflakes fall on the front lawn. also, i'm adding you to my sidebar :). My favorite Xmas memory is getting my bike. All the presents had been opened and I was so surprised to be told to look around the corner of the living room for another gift. Wearing a long shimmering red dress, dancing with my new husband to a steel drum band playing Christmas carols in St Lucia on my honeymoon. Yeah... nice. Did I mention how much I would love to win this? ...and added you to facebook. if I twittered, I would do that too...but I don't...so I'm done. Okay, get your tissues Sar! When he passed away, it was sudden and unexpected. A month after his passing my mom went up into our attic to hide xmas presents from Jill and I. This is when she found all these xmas gifts for us, that she had no idea where they came from. She then saw they were for us, from "Grandpop". Before he died he had hid them up there for us. It is like he knew he was going home to be with the Lord, and wanted to make sure we had gifts from him before he passed. It was so eary and magical at the same time. Those were the most special gifts I have ever gotten, and I was thrilled to find a little piece of "Grandpop" in our house after his passing. I still think about him every Christmas, and how special he was to me. My favorite Christmas memory is of my grandparents. They both passed away before my tween years so there is very little I remember but I do remember the holidays. We used to cram into their little house and play the Intellivision (OLD!) in my grandmother's room. The adults would play wiffle ball in the back yard and the kids would interfere. We would have great food on card tables because there was no where else to eat. It was one of the very few times when my entire family got together at once. my favorite christmas memory is waking up really early running into my older brothers room and waking him up (much to his dismay) =) then my dad would have us sit on the top step (even up till we were in our teens (like 18) and he would check to see if santa came---- what a great memory!!! my favorite memory is making popcorn strings for the christmas tree!! and my dad always reading the story of Jesus birth before we could open any presents.... such good times! Some of my favorite memories are when Pap and Gram Bell used to come over for soup and sandwiches after the Christmas Eve service, and we would open our gift from them and one from mom. We were always dressed up from church, and mom set the table using her china. Then, for breakfast Christmas morning, mom would be up early getting a nice breakfast ready, Dad would have music playing, and Pappy and Grandma Myers would be over. This was our one on one time with my grandparents and having their undivided attention was special to me. I linked you to my facebook account! Christmas is my absolute favorite holiday/season and thus full of memories. One childhood memory, however, is especially vivid. I was in fourth grade and our family was going through a bit of a rough patch financially but that didn't stop the joy in our home. I remember wanting to do something special in addition to the traditional advent wreath. I decided I would make my own nativity setting. I sewed colorful felt together and used cotton to stuff the miniature dolls of Joseph, Mary, Baby Jesus, 2 angels, and 2 shepherds. (The wise men were beyond my talent and I figured they weren't supposed to arrive until the Epiphany anyways. )Using buttons and markers I gave them faces and hair. It was my little gift to Baby Jesus for his birthday and that made that Christmas extra special although there weren't many gifts underneath the tree that year. As I set it up every year I pray for the gift of simplicity, purity, and joy of a child. Merry Christmas!!! retweeted! :) I hope many others share their wonderful stories! 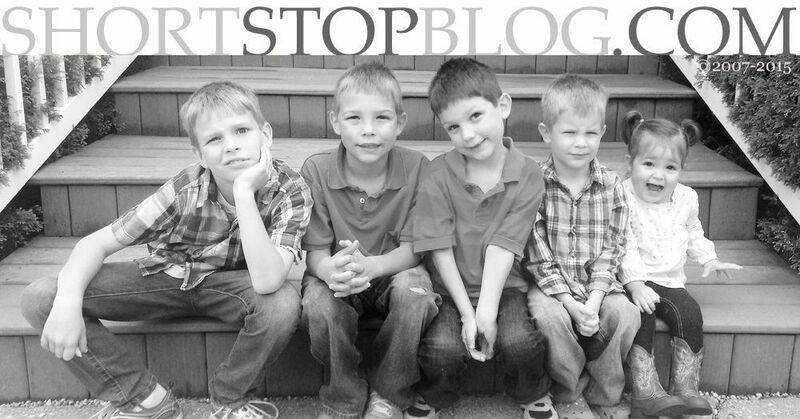 Haha!I figured out how to add the button to my blog. That's all 4 entries for me! Thanks for doing this, Sarah! You are awesome! Without a doubt my fav Christmas memory is trying to fix all the broken strings of lights with my dad! He and I would pain stakingly replace bulbs to see which one was dead and delight in bringing them all back to life! Our dad was and has always been the church musician so Christmas eve was frequently spent out late into the night. On Christmas eve every year at night while driving home from church we would anticipate the stroke of midnight then roll down the windows and scream "Merry Christmas!" over and over. Being a kid it was really cool to be up that late and screaming in the car. Not a specific memory per se, but my grandmother, who passed away when I was 16 LOVED Christmas. Every Christmas I am reminded of her childlike pleasure in gift giving and everything Christmas!